Face Ia: Thirty two point wind-rose with numbered points, sixteen being named with initials, 'Nort' in full; central index in the form of a hand with pointing finger, and inspection hole for the compass in face IIa. Surrounding the wind-rose is the inscription 'PERGE SECVRVS MONSTRO VIAM'. Face Ib: Diagram for the length of the day with lines and zodiac symbols in red, hour lengths in black, above a list of latitudes of places in alternating groups of red and black for places of the same latitude, in two columns: 'Hamburg 54', 'Lvbeck 54' / 'Stetin 54', 'Danczig 54' / 'Antorf 51', 'Breslav 51' / 'C?len 51', 'Brusel 51' / 'Nvrnberg 48' , 'Agvsburg [sic] 51' / 'Raab 48', 'Strasbvrg 48' / 'Wien 48' , 'Paris 48' / 'Leon 45', 'Genf 45' / 'Trient 45', 'Ferar 45' / 'Meiland 45', 'Venedig 45'. The four groups of latitudes correspond with the values for the attachment holes for the upper end of the string-gnomon placed centrally. Below the latitude list is the maker's signature. 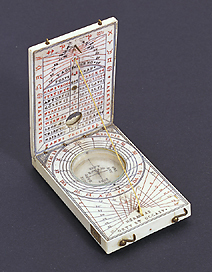 Face IIa: Inset compass with the cardinal points named and magnetic declination mark, for approximately 6? East surrounded by a horizontal string-gnomon dial marked 'HORAE AB MERIDIE' with four hour rings corresponding to the four different latitudes. Pin gnomon dial for Italian and Babylonian hours marked 'HORAE AB ORTV ET OCCASV'. Face IIb: Central lunar volvelle with 2 ? 12 hour scale used for converting between lunar and solar time against the fixed 2 ? 12 hour scale marked around it and in turn surrounded by an age of the moon scale (1 to 29). Surrounding this are scales of Gregorian and Julian epacts, and the whole set of scales is labelled 'DIES ?TATIS LUN? ET HOR? NOCTIS'. Below the scale is the maker's mark of a six pointed star repeated twice.